In the displayed dialogue box, enter the voltage limit into the Safety limit box (blue rectangle), and click on close (green rectangle). 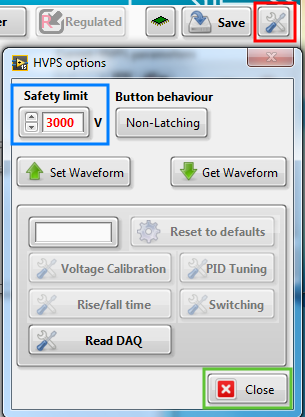 Then, as illustrated on the figure below, when the user enters a voltage set point (green square) higher than the limit, the HVPS limits the set point to the safety value (blue square). The field is blinking to attract the user’s attention to the fact that the chosen set point is not being respected. The feedback voltage (red square) shows that the output voltage is indeed limited to the defined value. When you define a limiting voltage, it will be enforced the next time you change the voltage set point. For example if the HVPS has a set point of 4kV with no safety limit, and a safety limit is then defined at 3kV, the output voltage will not drop to 3kV. However, next time you change the voltage set point (for example going from 4kV to 3.9 kV), the limit is enforced, and the output voltage drops to 3kV.